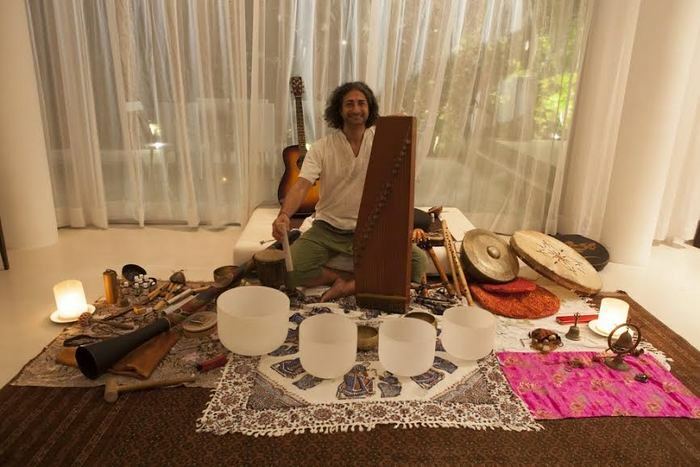 Shervin Boloorian with the tools he uses to perform sound therapy. Photo provided by Shervin Boloorian. 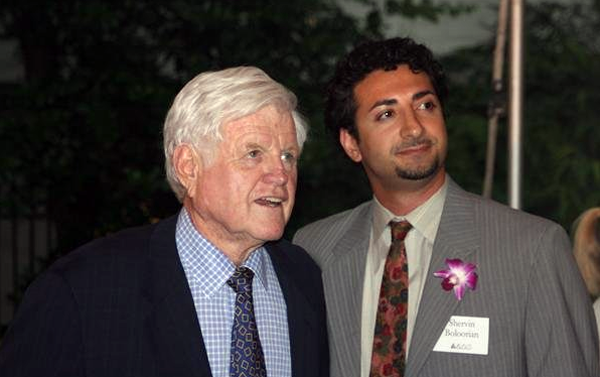 Boloorian poses with politician Ted Kennedy while working on Capitol Hill. Photo provided by Shervin Boloorian. While working in student government for California State University, Northridge’s Associated Students (AS), one of Shervin Boloorian’s goals was to bring together fraternities and sororities, ethnic organizations and student-athletes to help foster a stronger sense of togetherness among groups on campus. Soon after graduation, Boloorian ’97 (Political Science), M.A. ’02 (Political Science) brought his desire to unite people to Capitol Hill as a coalition strategist for United States and Iran peace campaigns during the Iraq war. On paper, a career in Washington, D.C. seemed like the perfect fit for Boloorian. At CSUN, he served as the AS graduate student senator, was heavily involved with the university’s Model United Nations program and participated in the prestigious California Senate Fellowship program, which allowed him to go to Sacramento and work for state senators and later the California Congressional Delegation in D.C. But despite a successful career in Washington that lasted nearly a decade, Boloorian realized the career he had spent years pursuing was causing him more harm than good. After some deep introspection, Boloorian knew in 2009 that he needed to find a career that would give him more happiness and less stress. Later that year, he left D.C. behind, moving more than 10,000 miles to Bali, an Indonesian island about the size of Delaware. Passionate about music — he played in a band while at CSUN — and interested in spirituality and helping others, Boloorian intertwined the three and began practicing sound therapy, which uses sound, music and vibrational energy to help people suffering from physiological, psychological and emotional ailments. Through acoustic instruments and Chinese Medicine tools, Boloorian connects with people all over the world, helping those who are dealing with stress, anxiety, muscle soreness, mental clearing, emotional blocks, sleeplessness and much more. Although he’s in a different work environment, Boloorian stays busy. His days are filled with conducting private healing sessions, hosting workshop events in Bali, recording music and raising money for charitable organizations that include an AIDS/HIV youth charity, Bali water protection group, a bamboo reforestation project and a Balinese cultural dance troupe. Born in Iran, Boloorian took refuge England at 3 years old before coming to the U.S. at 16 to live with his sister in Southern California. At CSUN, Boloorian excelled in the classroom. But what he now takes away from his experience goes beyond intellect. “There’s no more diverse campus than CSUN — not just in terms of the ethnic spread, but in terms of the different ages of people and the different stages of their lives. I learned how to appreciate everyone,” Boloorian said. “I also wouldn’t have been able to take the steps I did without the kind of leadership and community awareness that I got from being involved at CSUN. As far as what’s next, the father of 8-year-old twin boys is launching a new album and sacred music awareness campaign. He said he hopes to return to the U.S. with a specific goal in mind. “I’d love to come back to CSUN and visit the Oasis Wellness Center,” Boloorian said. The Oasis, which is located in the University Student Union and opened in 2015, features a wide range of health and wellness programs intended to promote student academic success. The facility offers indoor and outdoor lounge spaces, acupuncture, meditation, yoga, massage therapy, stress relief, power napping sleep pods, health and wellness workshops and much more. For an update on Boloorian’s newest project, view here.